Find out everything you need to know on the new Infiniti Q30 from independent vehicle review website Car And Driving. You can watch the video review to the left to see more of the car or read their written review below to get a true insight from an expert in the automotive industry. With the Q30 premium hatch, the Infiniti brand has at last come alive. The experts at Car & Driving check out the volume 2.2-litre diesel version. Infiniti has powered into fresh territory with the Q30 2.2d but has brought with it a unique take on luxurious design and superior build quality. Comparatively large for the five-door premium hatch segment, the Q30 has an elevated stance, loads of useful autonomous driving technology and even a smartphone style app store. It's probably at its best in 2.2-litre diesel form. The Q30 is the car that Infiniti hopes will turn its fortunes around. It's a premium hatch, very much in the mould of a BMW 1 Series or a Mercedes A-Class, and it also comes in QX30 Crossover guise if you require more of a Crossover-style feel. The marque is Nissan's luxury brand, very much as Lexus is to Toyota but, despite great success in the States, it's yet to really take off here. The Q30 though, could be a game-changer. Buyers prepared to give the brand a chance and consider this car are probably going to be targeted towards the variant we're looking at here, the 2.2-litre diesel version - though for less money, there's a 1.5-litre diesel or a 1.6-litre petrol variant to try. The 2.2 diesel is ideally the version to have though. It'll be efficient to run and features lots of clever tech. You might really like it. This Q30 2.2d model's Mercedes-Benz-sourced 170PS engine propels the car from 0-62mph in 8.8 seconds. While that may not be blistering acceleration, this Infiniti is designed more around metropolitan comfort and style rather than outright performance, though if you really want it to, this variant will top out at 134mph. This variant is only available with 7-speed automatic transmission and buyers get the option of either front wheel drive or four-wheel drive. In town, the Q30 benefits from a host of driver-aids, including Forward collision warning and emergency braking, lane departure warning and blind spot warning. Perhaps the most practical help though, comes from the 360 degree camera system which gives an overhead view of the car and its surroundings on a central dashboard screen that shows the distance from nearby objects. This makes parking very easy, but if you're still not totally confident reversing into a space, the Q30 has 'Intelligent Park Assist', using sensors and cameras positioned around the vehicle to steer you perfectly into the gap. The slightly raised ride height of this model means you get a commanding view of the road from the sumptuous leather seats. Infiniti describes the Q30 as a 'new kind of Premium Compact Car'. It certainly has more overtones of Crossover in its slightly raised ride height but the Audi Q3 / BMW X1 premium compact Crossover market is really a segment Infiniti wants to go after with the QX30 version of this model, which features slightly more SUV-like styling. The Q30 in contrast aims at people who'd otherwise be looking at an Audi A3 or a Mercedes A-Class and genuinely does seem to offer something a little different to that kind of buyer. A sweeping crease-line, from the front grille to the rear, breaks up what might otherwise be a slab-sided body, with door handles neatly positioned along this contour. In profile, the narrow, tapering glass area gives the car a sporty look and the signature kink in the rear pillar stands the Q30 apart from other luxury hatchbacks like the Lexus CT which, by comparison, looks dated. Glossy black wheel-arches and side skirts give the impression of good ground clearance and emphasise the higher driving position. Inside, luxurious textiles and subtle lighting around the cabin create an undeniably upmarket ambience. Built in Britain, and underpinned by a Mercedes-Benz engine and chassis, the Q30 2.2d has quality engineered in at every level. Most Q30 models will be sold at around the £25,000 mark but you'd looking at around £30,000 for this top 2.2d variant. There's a premium of around £1,600 if you want the 4WD version rather than the front-driven model. All 2.2d models have a 7-speed auto gearbox. This pricing is comparable with premium hatch rivals like the Lexus CT200h and the BMW 1 series, cars with which the Q30 is expected to compete. While design is always subjective, the attention to detail involved, inside and out, seems to justify the Q30 2.2d's price. Top versions are certainly well equipped, fitted out with features like 18 inch alloy wheels, chrome exhaust finishers, a black Alcantara dashboard finish and heated front seats. Premium trim options include 'Gallery White' and 'Cafe Teak' interiors, the first of which includes white Nappa leather with Infiniti's signature purple stitching, which looks better than it sounds, while 'Cafe Teak' comes with a more mature, dark brown leather and a black interior. All models come with Infiniti's 'InTouch' in-car connectivity centre - a tablet-style multi-touch screen with access to vehicle apps, such as e-mail, performance statistics, a calendar, and a compass, while pre-installed smartphone style apps include Trip advisor, Facebook and Twitter. The system will allow you to download more apps as they become available. Infiniti targets the higher end of the market with the Q30 but that doesn't that efficiency is any less important to buyers. As you'd expect, the smaller-engined 1.5-litre diesel would be a more frugal choice in this car but the all-wheel drive 2.2d variant we're looking at here still manages to put in a commendable effort. With a 55mpg combined cycle fuel return, refuelling shouldn't be too frequent. This version falls several tax bands higher than the 1.5-litre diesel model, so it will cost £130 per year to tax, thanks to CO2 emissions of 127g/km. That falls to 116g/km if you opt for this 2.2d variant in front-driven guise. The Q30 is not currently offered as a hybrid, so the rival Lexus CT200h offers an advantage in this regard. 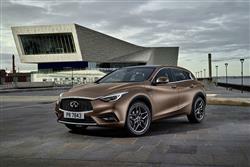 Infiniti dealers have admitted being taken by surprise by demand for the Q30 from new and existing customers, so residual prospects are looking good. The basic warranty covers fault repairs for 4 years or 60,000 miles, which compares well to most competitors. The Q30 will appeal to a much younger buyer than the brand's larger Q50 and Q70 saloon models, so expect insurance to reflect the additional risk associated with both prestige cars and younger drivers. The Q30 premium compact hatch aims to attract a younger, wider audience than Infiniti has ever served before and should manage to do exactly that. The sweeping design works well with this model's high stance and well appointed interior to create an upmarket competitor to Lexus, BMW and Mercedes in this segment. If you were looking at a BMW 1 Series, a Merc A-Class or an Audi A3, this is certainly an option you should be adding to your wish list. The adoption of Mercedes engineering has given Infiniti a short-cut to matching such illustrious rivals but there's also plenty of the Japanese brand's own innovation in this design. In short then, a different and interesting newcomer to this segment that's probably at its best in this top 2.2-litre all-wheel drive diesel guise.